Posted on: March 29, 2014. Walking Dead‘s Glenn Rhee, played by Korean-American actor Steven Yeun, is not the stereotypical Asian-American male in most Western mainstream media. He is just a former pizza delivery guy from Michigan who is pretty good at stabbing and stomping zombie brains. His love and devotion to his wife, Maggie, and his bonding with group in the prison are no different from most men of other cultures. Glenn does not use any mathematical genius to calculate the time it takes for the group to travel from one place to another, nor does he use any special kung fu kicks or ancient Chinese secrets to overcome ravenous zombies or sociopathic tyrants and bandits. For example, in Season 3, a simple headbutt was his response to Merle’s snide comments about his wife. No karate chop needed. There has been much discussion about the lack of legitimate film and TV roles for Asian-American men in a predominantly “black and white” entertainment industry in the United States. Not only are Asian-American portrayed as shy and somewhat anti-social nerds, martial art masters, or bumbling immigrants who speak with a heavy accent, they are sometimes substituted by White actors to play Asian roles. Examples of this can be seen in the movies 21 and The Last Airbender and in the 1970s TV series Kung Fu, starring the late David Carradine. The stereotypes among Asian-American males did not stop Yeun from flying to L.A. from Chicago to star in The Walking Dead. He was nervous about what is expected of him during the initial wardrobe fitting, and he tried not to think about who he looks like. “They put me in these clothes that made me look like Short Round,” Yeun said, referring to the sidekick who screamed, “You call him Doctor Jones!” inIndiana Jones and the Temple of Doom. He bit his lips and told himself to not to worry about his appearance or what others may think of him. Yeun’s character fulfills roles that can be played by anyone. 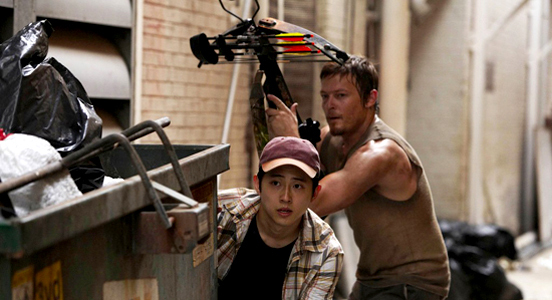 Of course, there are a few times when Glenn’s race and Korean heritage are mentioned, such as in Season 1 when Daryl referred Glenn as a “Chinaman,” in Season 2 when Maggie’s father, Herschel, asked where he’s from, and in Season 3 when Merle remarked to Daryl that he “damn near killed that Chinese kid,” in which Daryl corrected, “He’s Korean.” These are very minor details that can be changed or omitted according with the character. Before the Walking Dead star became a familiar face on prime time television, Yeun had worked briefly in theater in Chicago and had turned down a gig. He thought that would be portraying the negative stereotypes among Asian-Americans. The producers of the gig asked him to do an eighties monologue, and Yeun opened one from Ferris Bueller’s Day Off. After that, they asked him if he could do an Asian accent. Yeun turned skeptical. What the producers really wanted to see was Yeun playing the character Long Duk Dong from Sixteen Candles. “After that, they wanted to book me and I just refused,” Yeun said. The Walking Dead is not the only show that portrays more variety among Asian-American male actors who are playing roles that are not dictated by stereotype, race, nationality, or accent. These actors including John Cho from Harold and Kumar, Daniel Dae Kim from Hawaii 5-O, and C.S. Lee from Dexter. However, the pioneer to resisting Asian-American male stereotypes should be accredited to George Takei, the famous helmsman of the U.S.S. Enterprise on the original Star Trek series who proved that Asians can drive. This entry was posted on Tuesday, April 8th, 2014 at 7:41 AM and is filed under Culture, ISSUES.